"Now, the CRA seems like a poor piece of legislation. Straightforward Econ 101 tells us that, if the goal is to help poor people, it is more efficient to do this by simply giving them money rather than coercing someone else to help them"
This is one of the problems with Econ 101; students are never typically told that that depends on perfect information, perfect self-discipline, perfect expertise, no psychological disutility of choice, no externalities, etc., etc. Unfortunately, this isn't usually taught until second or third year economics which few people take. As a result of these things excluded from Econ 101, often people, and certainly society, are better off when they're not just given money. That said, the CRA in particular looks bad to me. Owning a home is not a good thing if you can't reasonably afford the payments, if you're not going to stay put for long, and other reasons. Owning a home is not always good, and neither is having access to credit, especially at high or exorbitant prices. Your number 3 has a semantics problem and can be misleading. When Republicans say it's the government's fault, what they mean (or what they want you to think) is that these problems occurred because of what the government did, and everything would have been great if the government did nothing and just let the free market be 100% free. What others mean when they say it was the market is that these problems occurred from government not doing enough to stop the harmful things the unfettered free market would do. First, thanks for following this up. I still think your conflating the arguments of "Fannie & Freddie need to go" with "Fannie & Freddie did it," but overall I thought your post was pretty even-handed. 1) Re the CRA, most of the private-sector mortgage originators/securitizers weren't subject to the CRA, so it's even harder to blame that act (again leaving aside other possible flaws with it). 2) Sub-prime mortgages that were subject to the CRA actually performed better than average. 3) Re your number 3, and following up on Richard's comment, I think you could've pointed to things like Gramm-Leach-Bliley or Congress prohibiting the CFTC from regulating derivatives as useful counter-examples to the "too much evil guvmint" line. "The cause of the problem was faulty design and faulty regulation." 1. Clarify this statement. What design, and what regulation? If by securitization design you mean the deregulatory 1984 Secondary Mortgage Market Enhancement Act, that just left the design up to Wall Street. 2. What's your take on the role of the Canada Mortgage and Housing Corporation in the stability and extension of credit in the Canadian mortgage market? CMHC throws off some of your narrative, no? Baloney. Can-Am homeownership rates have been relatively equal for generations and it is straightforward for a Canadian to make mortgage interest tax deductible for investment purposes. The CMHC book of business in the Canadian residential mortgage market is substantially more interventionist than Frannie and the FHA/VA. As of 2009, CMHC MBS guarantees and in-force insurance accounts for 85%+ of outstanding mortgage credit. Canadian chartered banks and other financial intermediaries are for the most part mere servicers, not at-risk investors, in both the MBS and portfolio mortgage market. The Big 5 banks in Canada put their fingers in the U.S. Federal Reserve Bank $3.3 trillion cookie jars during the panic. Also, I look to forward to seeing your response to the points raised wrt the CMHC. The real lesson from Fannie and Freddie's role in the crisis is that private risk taking and public guarantees are a combustible combination. In other words, moral hazard. Risky loans had higher profit margins, and the GSE's bought them to eek out a higher spread and generate higher returns on assets. The GSE's were essentially hedge funds with giant balance sheets, only they were allowed to have more leverage than any hedge fund, and the tax payer was put at risk for any losses. IMO, this was the outcome of a corrupt lobbying process rather than any ideological pursuit (plenty of Republicans were on the GSE contribution "payroll"). "Clarify this statement. What design, and what regulation?" The design problems go back to the 19th century at least. The US financial system got off on the wrong foot. We keep trying to fix it, and keep creating more problems. 1. You may find a way to deduct the mortgage interest on a rental property in Canada, but no homeowner can deduct mortgage interest on a principal residence in computing personal income taxes. 2. CMHC is akin to the FHA. It does some direct lending, and it insures mortgages. 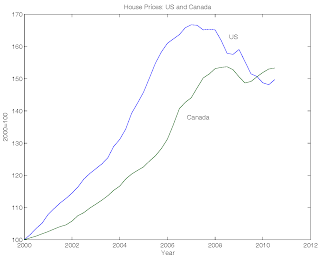 Its role in the Canadian mortgage market is small relative to what is going on in the US. 3. The notion that Canadian chartered banks act essentially as mortgage servicers is ludicrous. Actually, your graph looks like it could be bad for Canada. Higher (real) housing prices do far more bad than good over the long run. Who benefits? Only the small percentage of the population that will be moving from a bigger house to a smaller one (or relatively more expensive to relatively less expensive), and some investors. I'd be happy if the average home price dropped to one cent. In the long run the gainers would swamp the losers. A house, for most people, is more of an expense (albeit usually a necessary one) than an investment, like a car (the average return is a smidge above inflation on a house, but is negative when adjusted for risk and opportunity cost). Like a car I'd be happy if its cost went the lower the better, even to one cent. ... no homeowner can deduct mortgage interest on a principal residence in computing personal income taxes. You are in error. Purchase-money mortgages are not the only type of mortgages in Canada. Learn to read more skillfully. CMHC is akin to the FHA. It does some direct lending, and it insures mortgages. Its role in the Canadian mortgage market is small relative to what is going on in the US. You are in error. 80% market share is not small. And the CMHC has public policy mandates similar to the CRA. The notion that Canadian chartered banks act essentially as mortgage servicers is ludicrous. If a bank off loads credit risk on "full faith and credit" CMHC and has limited unhedged duration risk due to short mortgage terms, it is just a spread servicer. Service my spread if the customer pays on time and collect from CMHC if the customer defaults. "Purchase-money mortgages are not the only type of mortgages in Canada. Learn to read more skillfully." OK. Tell me about it. "You are in error. 80% market share is not small. And the CMHC has public policy mandates similar to the CRA." See my next post. You have a point, but I have no idea where your 80% comes from. This is market share of what? If you mean insured mortgages as a percentage of the total, it's too high. If it's MBS as a fraction of total mortgages outstanding, it's way too high. 1. You're only talking about insured mortggaes, obviously your argument does not apply to conventional mortgages, which are still a large (though shrinking) fraction of the total. 2. On the insured mortgages, you're exaggerating. In the US, for example, typically an originator screens the loan, the loan either ends up in some financial institution's portfolio or is bundled into mortgage-backed securities, and some third party may collect the loan payments and maybe pay property taxes and insurance. The third party is the servicer. If a Canadian chartered bank holds an insured mortgage, it is the originator (it screened the loan), the holder of the mortgage, and the servicer. Further, I'm sure that in the event of default, it's not just a matter of collecting from CMHC. Presumably the arrangement with CMHC is that the bank seizes the collateral and goes after the borrower's other assets. Since you claim to be an expert on this, maybe you can enlighten me? Don't stretch the truth. It does not help you make your point. It just makes me and others inclined to discount what you're saying. What is your point exactly? If you asked me to guess, I would say that you work for Fannie or Freddie, and you are trying to make the case that the Canadian mortgage market looks much like the US. This is certainly not the case. 1. You may be able to find loopholes that allow you to deduct mortgage interest, but the majority of Canadian homeowners can't do it. If you can give me the details about how to do this, let me know so that I can tell my relatives living in Canada. They would love to hear about it. The characterization that mortgage interest is not deductible in Canada is a fact. Everyone knows this. 2. CMHC's role in the Canadian mortgage market is important, and growing, and a lot of it is not good. That said, Canada does not have the severe incentive problems associated with Fannie, Freddie, and subprime lending in the crisis. The outcomes during the crisis bear witness to that view. Regarding market share. The CMHC insures about $475 billion in mortgages, probably 50% of Canadian mortgage debt outstanding. The federal government guarantees the CMHC's insurance. Privately owned Genworth insures about $225 billion in mortgages. The government also guarantees Genworth (although only to 90% of outstanding). The net result is that the government guarantees 65-70% of Canadian mortgage debt, which is the amount of mortgage debt currently carrying a Genworth/CMHC stamp of approval. 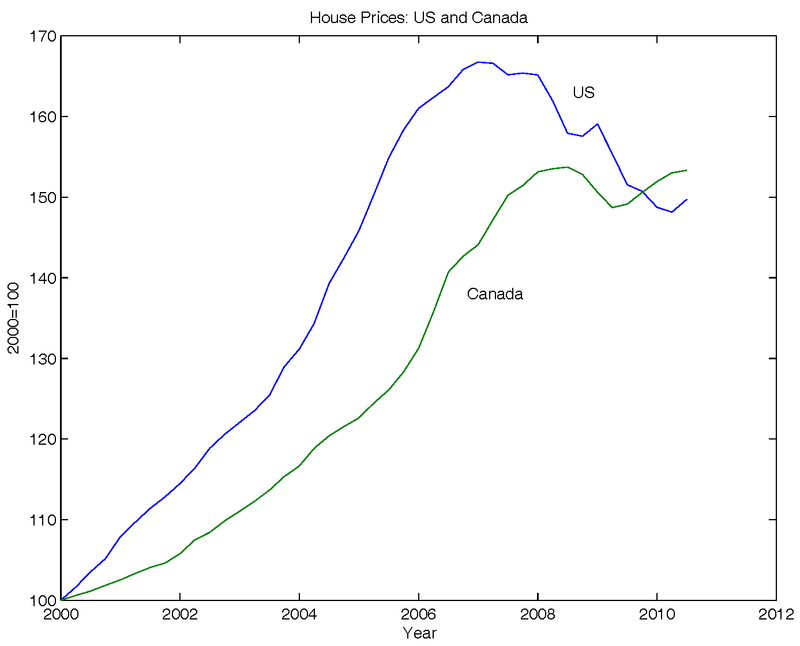 I mean looking at that graph again, real housing prices are over 50% higher in Canada in the last decade. This is nothing to be thrilled about especially for Canadian families, and especially if houses weren't that inexpensive to start with. They might be a lot better off if they didn't have their housing run-up not deflating, like in the US. Of course, deflation of a housing bubble can lead to a plunge in AGGREGATE DEMAND, yeah I said it, but there are better ways to maintain aggregate demand, like high return government investment of the kind the free market grossly underprovides due to externalities, etc., etc. I'm curious about what happens with an insured mortgage contract. 1. Does the insurance premium vary with the type of loan? For example, is it different for a 5% down payment vs. a 10% down payment? 2. What happens in the event of default? Who actually forecloses and goes after the borrower's assets? Say the Bank of Montreal holds the mortgage, I'm interested in the incentives that BMO has to exercise due diligence when they make the loan, and what the incentives are in the default stage. Do you think the contracts and insurance are set up in such a way that they have mitigated the moral hazard problem, or will BMO behave well because it is in a repeated relationship, and potentially faces increases in insurance premia if it does not behave well? "Canadian federal income tax does not allow a deduction from taxable income for interest on loans secured by the taxpayer's personal residence. But homes used in businesses as a landlord who owns a rental residential property can deduct interest as any other reasonable business expense. The difference being the deduction is allowed only when the property is not used for the taxpayer's personal use but is used as in any other type of business. However, there may be additional exclusions for passive activity losses. An indirect method for making interest on mortgage for personal residence tax deductible in Canada is through an asset swap, whereby the homebuyer sells his existing investments, purchases a house in full or in part by the sale, gets a mortgage on the house, and finally, buys back his investments with the money from the mortgage. The Supreme Court of Canada has ruled in 2001 in the Singleton v. Canada case  that transactions in the asset swap are to be regarded as distinct, thus rendering the interest on home mortgage acquired as part of the asset swap tax deductible. The home ownership rate in Canada is about the same as in the United States, but Canadians have about 70% equity in their homes on average (i.e., 30% mortgage debt), compared to only 45% average home equity in the United States." 1. Yes, for instance, see pg 10 of http://www.td.com/economics/special/el0610_cdn_mort_market.pdf, a good paper by Eric Lacelles on the Cdn mortg market. 2. My understanding is that banks are insured against mortgage default, but until default is officially declared, banks are held responsible by the CMHC for topping up unpaid balances ie. they face significant risks (collection and enforcement) as insured mortgages go into arrears and stay that way. I'm sure there are all sorts of court fees and legal frictions involved in moving a mortgage from "arrears" to "default".
" and as Koning points out, the private sector via GE Capital (Genworth)insurance makes it close to 100%." No, I pointed out that it was 65-70%. The remaining 30% is uninsured and probably on banks' balance sheets. As an aside, Anon, ad hominems and misquotations don't make for good copy. Thanks for all the information. My conclusion is that, while mortgage insurance with government participation has grown to actually exceed conventional mortgage lending, and MBS activity has also grown in Canada (also propelled by the government), this has not shown up in a significant increase in risk borne by the Canadian taxpayer or by the financial system. However, the trend is troubling. The mortgage and housing markets seemed to be working fine in Canada, say in the 1990s, and presumably an increase in the relative price of housing (particularly in Toronto and Vancouver) propelled a social policy of increased government participation to lower the cost of home ownership for low-income people. Of course you only have to look south of the border to see what the problems can be.